At 12 miles from Tahiti, the verdant mysticism of the “yellow lizard” flows forth from a shredded landscape that resembles a vast star-shaped garden branching out into eight valleys. Captain Cook’s island has one of the most beautiful lagoons. Its turquoise waters reflect the sumptuous harmony of the underwater world where divers might meet turtles, leopard rays or even some scorpion fish amidst coral roses hosting many other species. To the visitor, Moorea appears as a tropical garden filled with silver pineapple fields, the main agricultural product of the island. In the midst of this fairytale landscape, light rays pierce the Mou’a Puta (“the pierced mountain”). Was it just natural eccentricity, or according to the legend, made by the arrow of the demigod Pai. All of these, along with Afareaitu’s waterfalls or the famous Cook and Opunohu Bays, make this a magical place to stay. Ancient hide out of the royal family, Tahiti’s sister island became the home of Protestantism upon the Europeans’ arrival. Everyone can go to the Sunday morning mass, where people gather dressed in their best outfits and women wear beautiful hats or flower crowns and sing rhythmic psalms. Despite the many pensions, hotels, snack bars and restaurants of all sorts and the golf course, Moorea has not lost any of its authenticity. It has remained a savage and enchanting place where many myths have come to life. 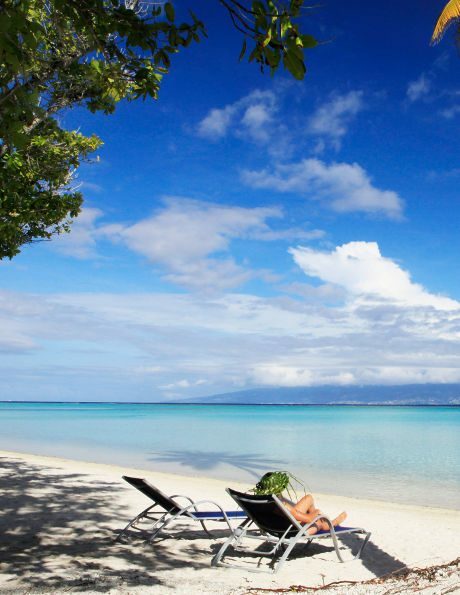 Enjoy the nicest of the Moorea lagoon, you will visit the two legendary bays, the "Cooks bay" and the "Opunohu bay". You will then swim with Sharks and Rays, and you will appreciate a tahitian lunch on a small magical island "the Motu". This fabulous tour will take approximatively 5 hours ! 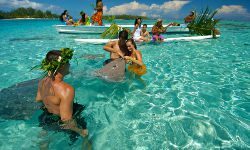 Included in this package: visit of the two legendary bays, the "Cooks bay" and the "Opunohu bay" + swim with Sharks and Rays + tahitian lunch on a small magical island "the Motu"
Discover Moorea jet ski and enjoy an unforgettable encounter with stingrays and sharks. 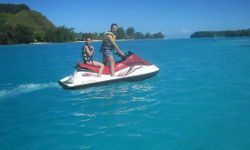 After an introduction on how to use the jet ski, you'll drive yours to discover moorea's lagoon, visiting first the bays of COOK and OPUNOHU. You'll meet dolphins, turtles (and whales in the July season to November) traveling these 2 bays. You'll then stop to snorkel over submerged statues. 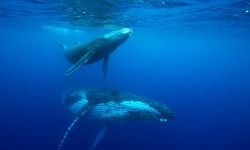 During the first part of the program (15min), we'll teach you about marine animal mammals (whales, dolphins, porpoised...), their anatomy, habits and behaviors. Then accompanied by a trainer (15 min), you will join the dolphin in deep water, you will play with him and observe him underwater. - No transportation inlcuded contact your travel advisor to set up these. Welcome to the interior of the valley of OPUNOHU and COOK'S bay by ATV off road tour. Visiting the Belvedere with the spectacular view of the two bays. Continue the tour by the agriculture school to visit severall plantation of fruit and flowers. 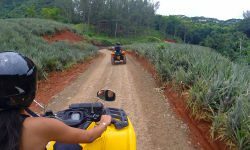 Visit the pineaple plantation and have fun crossing the rivers of the valley. Before the end of the tour you'll visit one of the most beautifull view of the island : the Magic Mountain. This beautifull 360° view will show you the OPUNOHU bay and the PAPETOAI village. Don't miss it !!! Enjoy the ocean-view beauty of Moorea and see dolphins (and possibly whales) within meters of the boat. Encounter wild dolphins and whales on the most exciting and informative eco-tour in French Polynesia, led by marine biologist Dr. Michael Poole's research team. Dr. Poole and his team have been conducting research on French Polynesia's dolphins and whales since 1987, and have been leading dolphin and whale watching eco-tours since 1992. 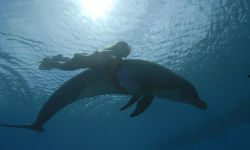 Observe closely, learn about, and photograph acrobatic dolphins, magnificent whales, and the dramatic beauty of Moorea. Relax with a snorkeling stop in Moorea's translucent, blue-green lagoon. Enjoy complimentary fruit and juice during the tour. The primary adventure of the tour is the search for and finding of schools of acrobatic spinner dolphins. Occasionally we find rough-toothed dolphins and pilot whales, and from July to November we also see those magnificent giants, humpback whales. One of the fringe benefits of the tour is the opportunity to see the dramatic, scenic beauty of Moorea from the water. The boat will slow down or stop to allow passengers to photograph the breathtaking scenery. Leaving the dolphins, and time permitting, a snorkeling stop in the lagoon is also offered. This stop is in shallow, clear water where fish and shells can be seen. Complimentary fruit and juice are offered during the tour. Typical fruit include bananas, papayas, pamplemousse (Tahitian grapefruit), coconut, and Moorea's world famous pineapples. Juice includes limeade, or a mixture of pineapple juice and coconut milk. Dr. Poole's research and his DWWE eco-tour have been featured on the Discovery Channel and Animal Planet, and people agree that this tour is the most adventurous, most informative, and most exciting water-based excursion in French Polynesia. Start each day with an unforgettable breakfast brought to the private balcony of your overwater bungalow or villa by outrigger canoe. Often bedecked in flowers, the canoe carries Polynesian staff serving fresh fruits, pastries, and juices while the surrounding waters begin welcoming the rising South Pacific sun. Canoe breakfasts are also available at many of the resorts throughout all the islands and can be reserved before you travel by your travel arranger or scheduled with the concierge on your arrival. Besides its natural beauty, Moorea is blessed with many excellent restaurants, each in unique settings alongside the lagoon. The resorts offer a romantic open-air ambience while serving the best of French, Italian, Chinese, and Tahitian cuisines. The gourmet "K" restaurant "Perouse "at Sofitel Moorea Beach Resort; the Arii Vahine at hilton Moorea Lagoon Resort & Spa; the Fare Nui at the InterContinental Resort and Spa Moorea; and a beachfront setting favored by locals at Hotel Les Tipaniers or Hotel Hibiscus. The Moorea Beach Café (nice view over the lagoon, French chic atmosphere & cuisine), Te Honu Iti (for the french cuisine), Rudy's, Alfredo's for Italian; and Mahogany (less expensive restaurant, french & tahitian cuisine). On the island's west side, try La Plantation for romantic settings and Tiki Village for an authentic Tahitian feast. Please note that most of the restaurants are including free pickup at your hotel on Moorea, contact your travel consultant to set these based on your wishes. 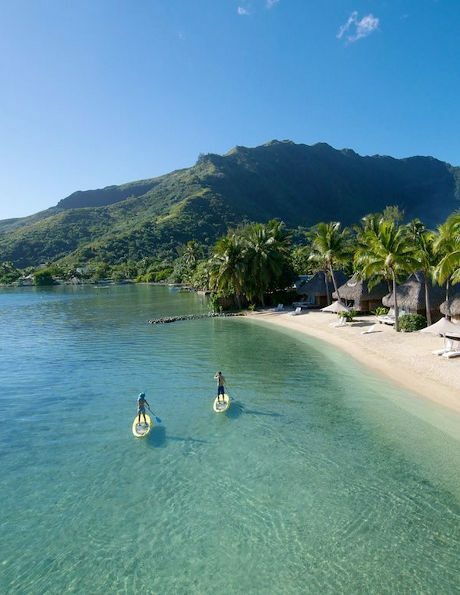 Bring your kids along to Moorea! With plenty of land and water activities, children and parents can experience this tropical world together. The central focus of a Moorea family vacation is the water. From boating and snorkeling to the discovery of gentle sea creatures, your children and adults can enjoy and learn about this pristine aquamarine world. And transportation is cheap from Tahiti island (due to the Ferry transfers which are less expensive then airplanes), Moorea is a must do island for family vacation. 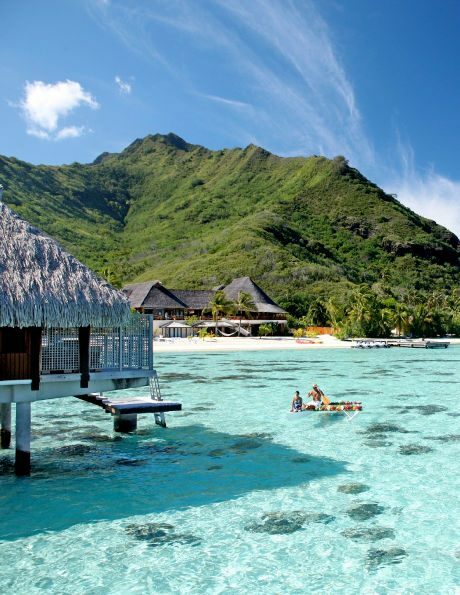 Because of the close proximity to Tahiti, Moorea is quick and easy to reach. Moorea's airport is served by Air Tahiti and Air Moorea with 10-minute flights from Faa'a Airport departing every 30 minutes. Air Tahiti also has regular flights between Moorea and Huahine, Raiatea, and Bora Bora. Passengers ferries operate up to six times daily between Moorea and the waterfront in downtown Papeete. Transportation from the airport or ferry dock to the hotels should be arranged in advance by your travel advisor at easyTahiti.com. The circle-island and interior roads are best discovered through hired excursions or by renting a car, while motorboat and outrigger canoe rentals are enjoyable ways to explore the lagoon and surrounding motu. Yachts can be chartered with or without captain and crew, and helicopters are available for island tours or for transportation to and from Papeete, all of which can be arranged in advance by yoru travel consultant. Health: 1 infirmary at Vaitape. Banks: 1 “Banque de Polynésie”, 1 “Banque Socredo”.